Correctly set-up W 9 and 1099 forms in QuickBooks to avoid IRS notices. The W 9 Form and QuickBooks 1099 form preparation – What Tax ID to Use? Do you complete the W 9 Form / 1099 form with the business name and business EIN on the first line? The IRS they will attempt to match this name EIN combination to what they have on file. You can avoid notices due to a matching 1099 form failure. only when the vendor’s tax status is a partnership tax return or corporation tax return can you use the business name on the first line of a W 9 Form and 1099 form. For individuals or a sole proprietor, the first line of the W 9 form and 1099 form should be the first and last name along with the Social Security Number or EIN. However, the IRS prefers the Social Security number. The business name can be entered on line 2. Not so strait-forward are LLC entities. For many years the W 9 form instructions for LLC’s were vague and left up to interpretation. But now the W-9 instructions are very clear. How should an LLC complete a W 9 Form? LLC businesses that report earnings on a partnership or corporation tax return should provide the company name and company EIN on the first line of the W 9 Form. 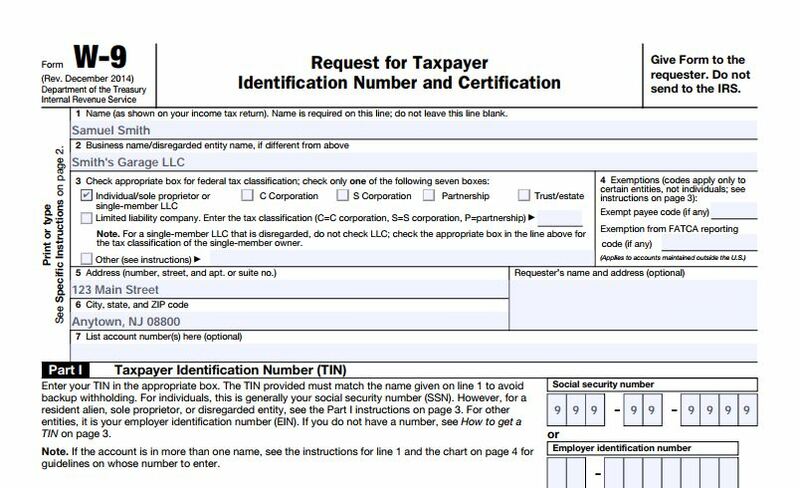 The 1099 form will print with the business name on the first line. Not so for Single Member LLC’s that file their business return on form Schedule C. For these businesses, the IRS indicates using the First and Last name of the owner (single owner LLC) on line one. You may put the business name on the second line of the W 9 Form. The 1099 will print with the First and Last Name on line 1. “Do not enter the disregarded entity’s EIN. Only if the LLC is taxed as a corporation or partnership, should you enter the entity’s EIN”. Bottom line, If your vendor is an LLC and checks the Sole Proprietor box, they must use the social security number of the owner for use on the 1099 form. Is the W 9 form completed correctly? Your vendor might resist providing the LLC owner’s social security number on the W 9 form for use on a 1099 form. It is the vendor’s responsibility to complete the W-9 form correctly. However, it will become a problem for you if the name and tax ID on the 1099 fail to match what the IRS has on file for that vendor. Therefore, take the time to review the W 9 form submitted when you see the tax classification “Individual/sole proprietor or single-member LLC. You don’t want to provide your social security number on the W 9 Form! Who wants to give their customer their social security number for the 1099 form? When your customer sees the W 9 form completed with a name other than the one they are writing business payments to, what impression does that give of your business? It could confuse the customer and leave them with an impression that you are small time. We called the IRS to see what our options were. Their only solution, “do not provide a W 9 form to the Customer, instead, give them a copy of the 147C letter” – a TIN validation. Really? The customer asks for a W 9 Form and instead you provide a 147C letter? Be assured, your customer will not be happy! And you run the risk of your customer thinking that you cannot follow a simple request! W-9s are standard business forms. Every small business providing services will be asked to complete one. Since the instructions on the W 9 form and 1099 form specifically request a social security number, the IRS agent completely missed the mark with this advice. The 147C letter only confirms the name and the EIN of the business, nowhere does it mention the owner’s social security number. Use EIN Number and Business Name? Ignore W 9 form and 1099 form instructions and put your business name and business EIN number? Several of my calls to the IRS resulted in the agent recommending to use the business name and EIN on the W-9 form. Of course, you have to sign it, under PENALTIES OF PERJURY” confirming that it is true, complete and correct when in fact it is not correct. Will the IRS accept the 1099 form with the EIN? It has in the past. However, they have the technology to add the form filed to their algorithm so is it worth the risk? It may be time to send a revised W 9 form to customers who have used your business name and EIN in the past. Use EIN Number and Your Name? Put your first and last name along with your EIN Number on the W 9 Form? This will most likely kick out an IRS Non-Matching notice (CP2100 letter) after the 1099 form has been filed. This notice will be sent to your customer who will have to spend time making corrections. Therefore, this is not an option. File for EIN Number Matched with Your Name? Acquire an EIN number under your First and Last name and use that on the W 9 form? Sole proprietors can use their EIN number on the W-9 form (although the IRS prefers the social security number). But LLC’s may not. Therefore, not an option! Unfortunately, when completing an SS4 application online you will be declaring under perjury to have a business under your personal name. Your business operates as an LLC not under your personal name. You must send a W 9 form with your first name, last name and social security number if you are a single member LLC filing your business taxes on form 1040. The instructions are very clear and this will avoid problems your customer will have dealing with these IRS notices due to a non-matching 1099 form. What happens when you complete the W 9 form incorrectly? When your customer’s accounting department is notified of an error on form CP2100 they will put it aside for their CPA at tax time to read. This notice rarely gets handled timely because the CPA is not given the folder until sometime next March of the 2nd taxable year after the 1099 form has been mailed into the IRS. When your customer receive’s a CP2100 due to non-matching 2 years in a row for the same vendor they must withhold 28% withholding tax from future payments they send you. This is a huge inconvenience for your customer! QuickBooks does not have the capability of tracking and reporting withholding taxes on 1099 forms, your customer wants no part of it and looks for other vendors to provide services! The solution to avoiding providing a social security number on a W 9 Form will be to elect that your LLC will be taxed as a corporation. Be sure to make the election to become an S Corporation. An S Corporation will require a separate tax return form 1120s each year. In addition the owner must take a reasonable wage (Payroll) from the company. There are costs associated with running payroll and filing an additional tax return however there are some tax benefits as well. Talk to your CPA about the savings in social security taxes. 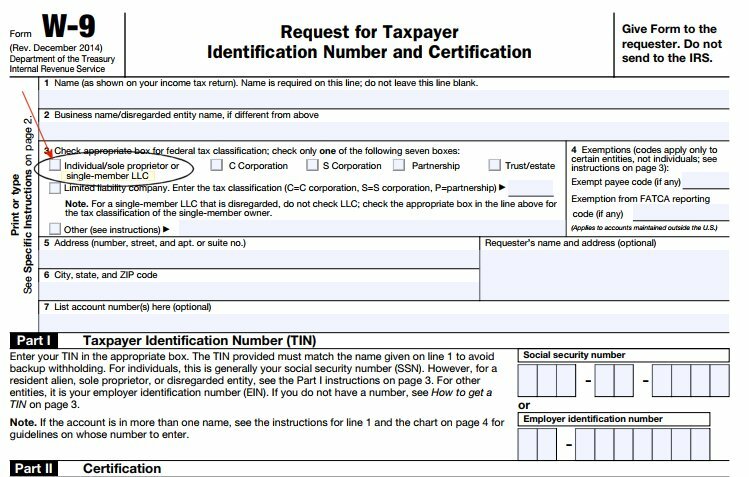 An S corporation avoids the issue of having to provide a social security number on a W 9 Form. This means the customer will put the Business name on the first line of the 1099 form along with the business EIN number. Now that you have a correct form W 9 form what should you do for this vendor inside of QuickBooks to ensure a 1099 form is generated? Request a W-9 Form from every vendor that provides you with a service or for whom you rent property from. If the W-9 vendor has checked the box of sole proprietor, partnership, LLC with a P-code they are eligible to receive a 1099 form. The form will provide you with the information needed to complete the vendor record in the vendor center of QuickBooks correctly. It is very important to enter into QuickBooks the exact spelling of the name and tax ID number to make sure it will match the IRS database. In the vendor center under the Vendor Record, complete the first and last name ONLY if the vendor checks the box Individual/sole prop./single-member LLC. For all businesses, including all LLCs, complete the company name field. 2. Enter in Tax Settings, that the vendor is eligible for a 1099 form along with the tax ID. We sell QuickBooks 1099 forms and W2 forms at discount. When you are ready to purchase your tax forms, click here to buy online, or call us to order by phone 800-216-0763. What happens when the Name and Tax ID on the 1099 form do not match the IRS records? Section 3406(a) (1) of the Internal Revenue Code provides that the payer shall deduct and withhold 28% income tax from a reportable 1099 payment if either the payee fails to furnish the payee’s Taxpayer Identification or the Secretary of the Treasury notifies the payer on form CP2100 or CP2100A that the Taxpayer Identification furnished by the payee is incorrect (2 out of 3 consecutive years). Section 6721 describes that a payer may be subject to a $50 per 1099 form failure to include a correct payee TIN or $100 if corrected after August 1st. And we NEVER want to subject our customers to a penalty or fine! The goal of the 1099 form reporting system is to help the IRS identify tax returns with under-reported income. If you receive a 1099 form with your business name and file the business taxable income under your personal name, the IRS matching system breaks down. The 1099 form information returns you file must include a correct Name/TIN combination to allow us to match the information reported against the income included on the payee’s income tax return. We check whether a Name/TIN combination is correct by matching it against a file containing all social security numbers (SSNs) issued by SSA or against a file containing all employer identification numbers (EINs) issued by IRS. Then we compare the name control on the payee document (if provided) to the name control on file. If a name control is not provided, we develop it from the name(s) provided on the first two name lines (up to 40 characters for each name line including spaces) of the information return. If we can match a provided name or a developed name control to the name control in our records, we consider it correct. If no match is found using this process, we consider the Name/TIN combination to be incorrect. The chart on the back of w 9 form has information for payees about “What Name and Number to Give the Requester” of W 9 Form. 301.7701-3 Do not check the LLC box. Enter the owners social security number. DO NOT enter the disregarded entity’s EIN. You can find the W-9 INSTRUCTION booklet full of detailed instructions as well as important definitions. Enter your TIN in the appropriate box of the W 9 form. If you are a resident alien and you do not have and are not eligible to get an SSN, your TIN is your IRS individual taxpayer identification number (ITIN). Enter it in the social security number box. If you do not have an ITIN, see How to get a TIN below. If you are a sole proprietor and you have an EIN, you may enter either your SSN or EIN. However, the IRS prefers that you use your SSN on the w 9 form. Instructions for 1099 reporting form indicate that the social security number is required or if applicable the EIN (of the individual, not the LLC). Below is an extract from general instructions for 1099 reporting. Sole proprietors. You must show the individual’s name on the first name line; on the second name line, you may enter the “doing business as (DBA)” name. You may not enter only the DBA name. For the TIN, enter either the individual’s SSN or the EIN of the business (sole proprietorship). The IRS prefers that you enter the SSN. Limited liability company (LLC). For a single-member LLC (including a foreign LLC with a U.S. owner) that is disregarded as an entity separate from its owner under Regulations section 301.7701-3, enter the individual’s name only on the first name line and the LLC’s name on the second name line. For the TIN, enter the individual’s SSN (or EIN, if the LLC owner is another business). If the LLC is a coporation, partnership, etc., enter the entity’s EIN.